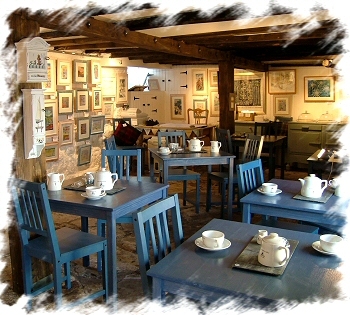 Crail Harbour Gallery and Tearoom is situated in the picturesque East Neuk village of Crail in Fife, just a short drive from St Andrews. It is on the road to the harbour, the medieval Shoregate, with stunning open views over the Firth of Forth and the North Sea. The gallery is located in the cellars of a 17th century fisherman’s cottage that has been carefully restored to reveal original stone walls, flagstones and exposed beams. Outside, there is a sunny sheltered courtyard from which to enjoy uninterrupted views over the Firth of Forth to the Isle of May. All of the art work is by local artist, DS Mackie, and features a wide range of paintings, drawings – originals and prints - influenced by local Scottish scenes. We also stock a selection of handmade cards and a variety of craft items and gifts.